Disney Parks around the world give people a chance to be transported to other worlds – the past, the future, and the films under the Disney banner, including Pixar, Lucasfilm, and Marvel. A unique opportunity exists at Epcot in Walt Disney World, where each year incredibly detailed topiaries bring to life some of the famous Disney characters seen on screen. Dubbed the Flower and Garden Festival, it is an annual event that is always celebrating some new characters. 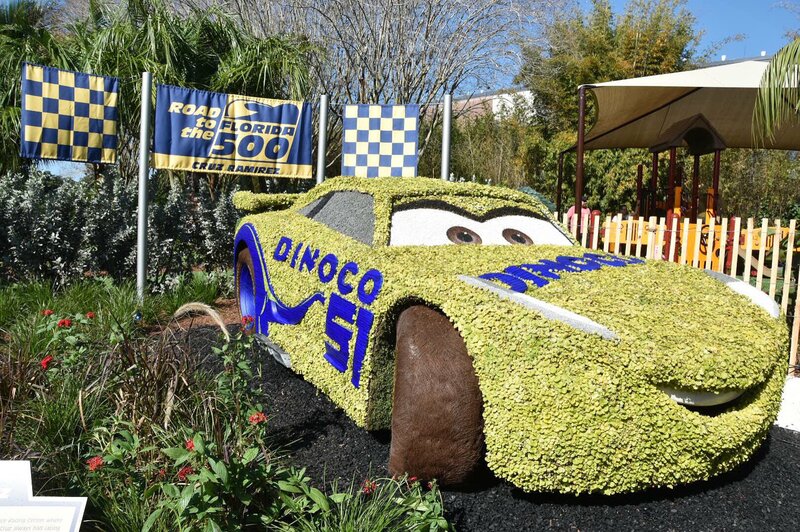 This year, a new character from Cars 3 made his debut – take a look at his topiary after the break! In addition to Lightning McQueen, there have been two characters primarily that we have been seeing in the film’s marketing, Jackson Storm and Cruz Ramirez. The latter was the lucky character to get a topiary. Both Ramirez and McQueen are represented in the “Road to the Florida 500” garden, according to MouseSteps, which captured the image above (in this tweet), along with the video seen below. The 2017 Flower and Garden Festival is currently underway at Disney World’s Epcot park. It is scheduled to conclude on May 29th. The following month is when Cars 3 will see its release in theaters – June 16th to be exact.